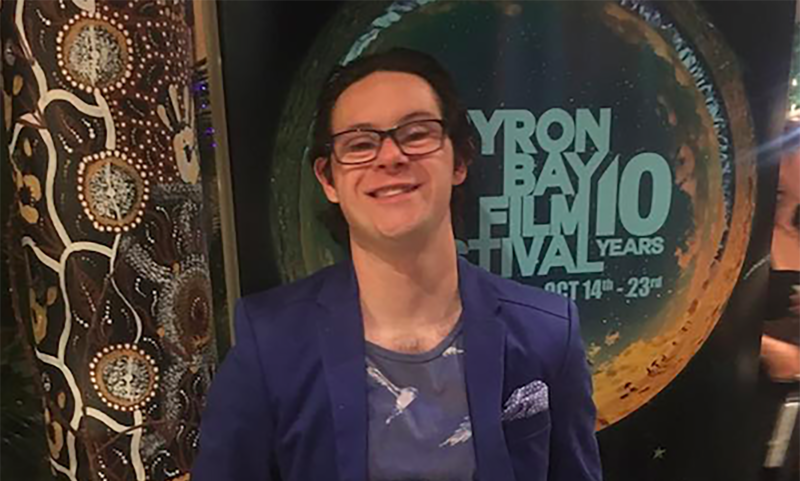 Nathan Basha at Byron Bay International Film Festival! Starting in 2006, the Byron Bay International Film Festival has become the largest regional festival in the country, supporting emerging and independent talent within Australia and around the world. Celebrating its tenth year in October 2016, BBFF delivered their most ambitious event yet, offering over 50 sessions featuring 185 films, virtual reality installations and other special activities. We were excited to be able to support our ambassador Nathan Basha to attend the festival this year in order to represent the film Heartbreak and Beauty which was selected to screen in competition at the festival. The film was developed over 10 months of filmmaking workshops with 12 students with an intellectual disability. Three students co-directed, Nathan being one of them and 9 students performed. After coming back to Sydney Nathan filled us in on his experience at the festival! How can you best describe your experience of BBFF? It was a really interesting experience, which I really enjoyed. I got to see movies that were of genres that I usually wouldn’t have gone to if I were able to pick so that was a great learning experience. It felt really great to be amongst other people who are passionate about film. What were some of your favourite films at the festival? I really enjoyed the session that showcased young film makers – they were all short films and some of them had really great twists to their ending or was a thriller. How did it feel to have your film shown at one of the largest film festivals in the country? As a Co-director it felt absolutely amazing and especially to be in a festival with such a high standard of films being shown. What were the festival goers’ reactions to Heartbreak and Beauty? Everyone really loved it. It was great that I was able to introduce the film as a Co-Director and let them know the story behind the film and the film-makers and actors who created and starred in it. We received a lot of applauses and afterwards I stayed round to mingle with the audience and some people asked questions, a lot of people loved it for its truth, rawness and beauty not only in cinematography but story as well. Nathan at the Byron Bay Film Festival before the screening of Heartbreak and Beauty! Do you think film festivals are a good platform to open up discussions about inclusivity? Yes as a film allows creativity and the chance to explore ideas that everyone and anyone can relate to, film allows for you to be taken on journey and the ability to tell stories. That’s why I feel a film festival is a great place to then explore other ideas and talk about important social justice issues such as inclusion. Has going to BBFF helped you grow as a filmmaker? Yes as I mentioned before I was exposed to lots of different films, including ones I wouldn’t of picked myself but it really expanded my thinking and ideas and I really enjoyed that experience. It was great to have been able to get up and introduce my film to the audience and describe the passion and story behind it. Film festivals allow filmmakers to really invest in their film project that they have been working on for months and years and showcase it to not only the general public but to people who are really interested in films and also their fellow filmmakers. What’s next for Nathan Basha? I’m heading to LA for New Years and staying in Hollywood, I am hoping to get more ideas and explore some film museums and gain some knowledge. I am excited to continue in my role as Ambassador for Bus Stop Films as well and to be spreading the message of the amazing and talented work we as students and our mentors do. Nathan in front of the BBFF media wall!